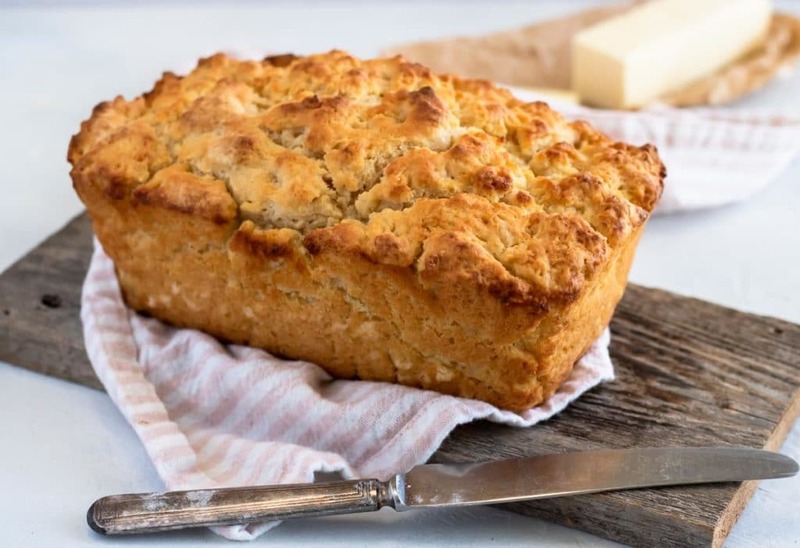 This Beer Bread recipe is easy to make and only requires 4 ingredients! It comes out of the oven with the most beautiful textured golden crust. By covering the dough in butter before you pop in in the oven you create a crispy, buttery top. 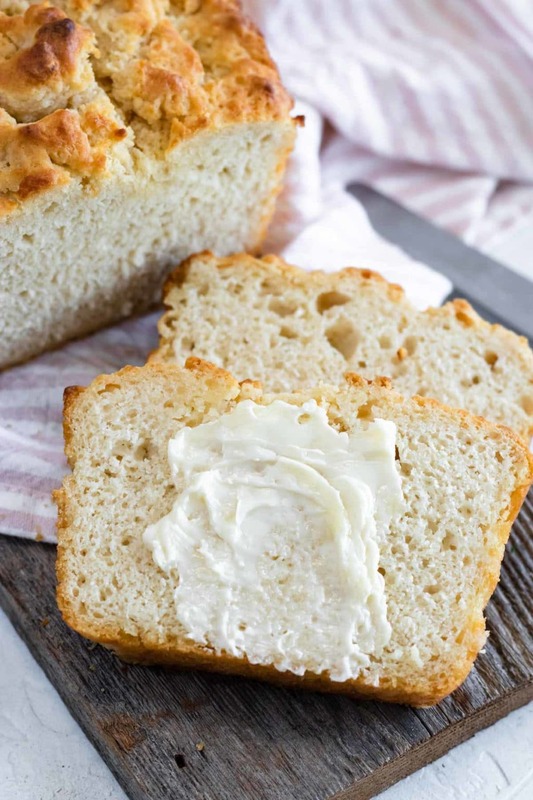 When you bite into a fresh slice you can literally hear the crunch of the crust, follow by the soft bread inside. The flavor is truly unique. It reminds me of a mellow sourdough with a hint of beer in the background. In a subtle, can’t place the flavor, kind of way. 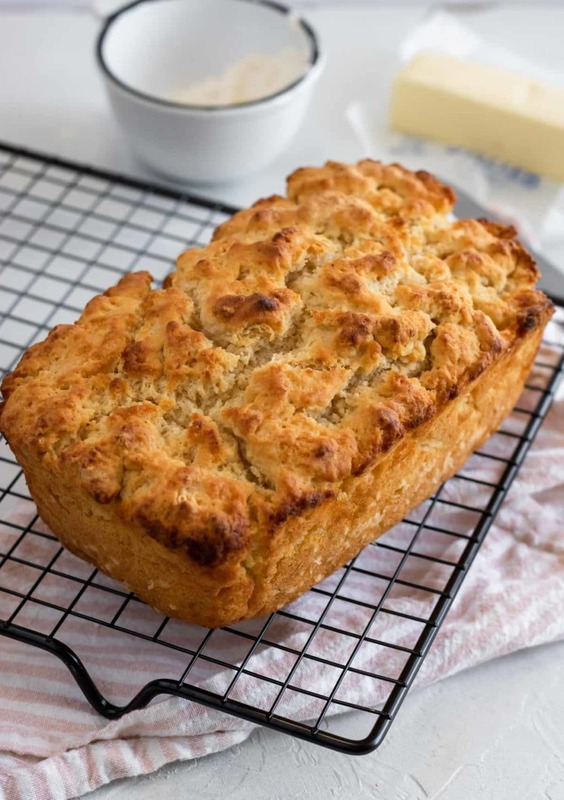 Is there a smell better that baking bread? I’m going to answer that for you, NO! Or how about the taste of a freshly sliced piece of homemade bread with (real, salted) butter melting over the top. My mouth is watering! 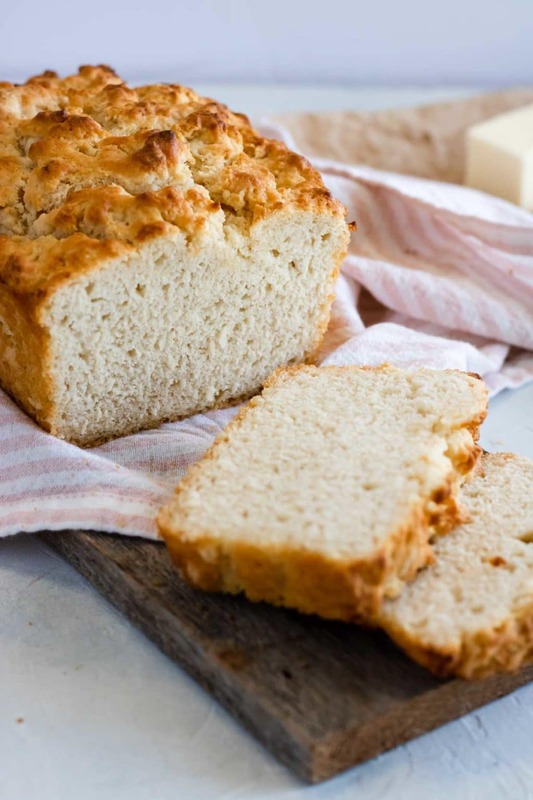 But let me quickly break you out of this carb trance with the the thought of kneading, proofing, kneading, proofing, waiting….exhausting….boring! I do not have time for all that. Do you?? That is why I was thrilled when my sister gave me this recipe a few years ago!! It requires no kneading, no proofing, no waiting! You just sift flour, open a beer, pour, and mix. Anyone can do that. Even my husband can do that, maybe. You will also need a couple bowls because there is a little sifting involved. Start by sifting 3 cups of flour into a bowl. Then out of that sifted flour measure 3 cups, you will be surprised how much is left after sifting and re-measuring! Mix the 3 measured cups of sifted flour with the sugar. Pour the beer into a seperate bowl, then pour the flour/sugar mixture into the beer. Stir the mixture very lightly JUST UNTIL IT comes together. Over mixing will cause your beer bread to be tough. Now bake the beer bread on 375 degrees for 40-45 minutes. Let the butter cool for about 5 minutes before digging in. From the research I have done online it looks like you can use just about any beer you would like, pilsner, light beer, stout, IPA. Just like using wine in food, use a beer that you would like to drink. Although I would recommend staying away from some of the new flavored beers, like lime and orange. I have used Miller Light, Bud Light, and Boulevard Pale Ale and they have all worked perfectly! Let me know in the comments what type of beer you choose to use in the recipe! Butter both sides and place them on a sheet pan. Add any seasoning you would like (garlic). Place in a 400 degree oven for 5-8 minutes, flipping the slices half way thru. 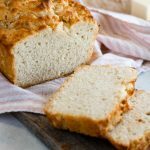 I hope you try this 4 Ingredient Bread in your kitchen. 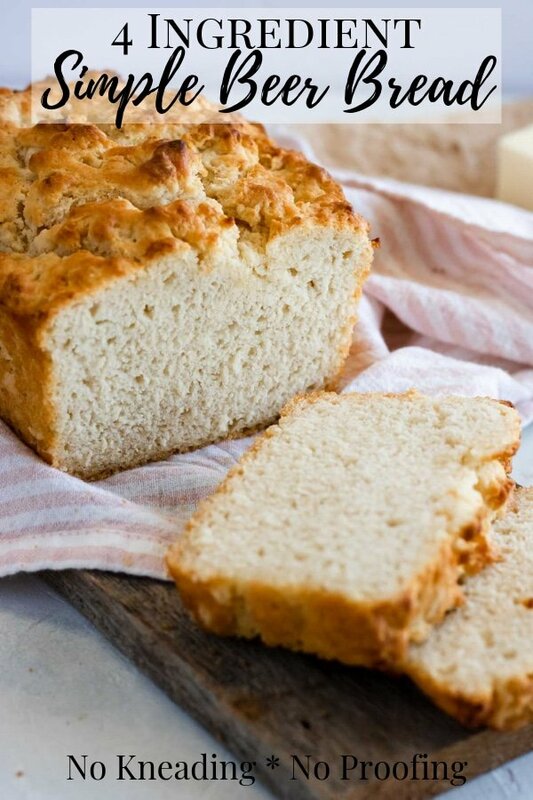 A super easy beer bread recipe made with only 4 ingredients. No kneading, proofing or waiting. Simply mix the 4 ingredients together and pop it in the oven. Customize the flavor with any herbs you would like. Preheat the oven to 375. Prepare your loaf pan with baking spray. Pour beer into a large bowl, and set aside. Sift 3 heaping cups of flour into a separate bowl. 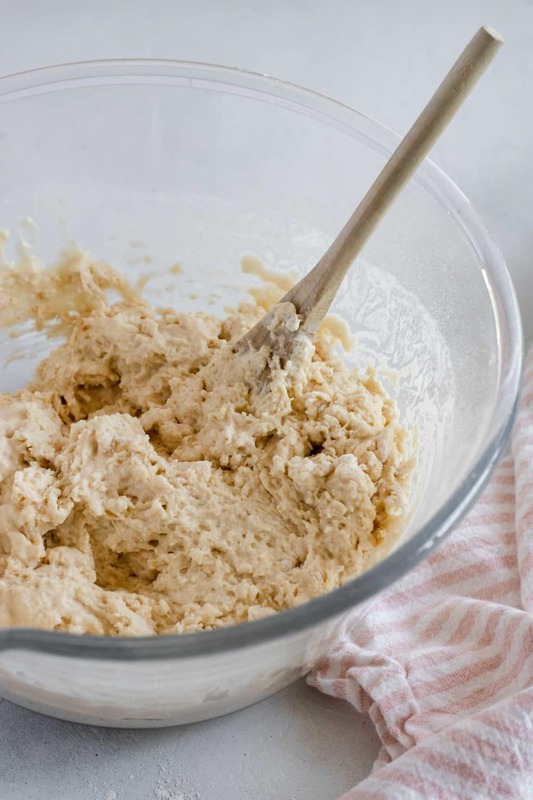 Measure three exact cups from that sifted flour into another bowl. 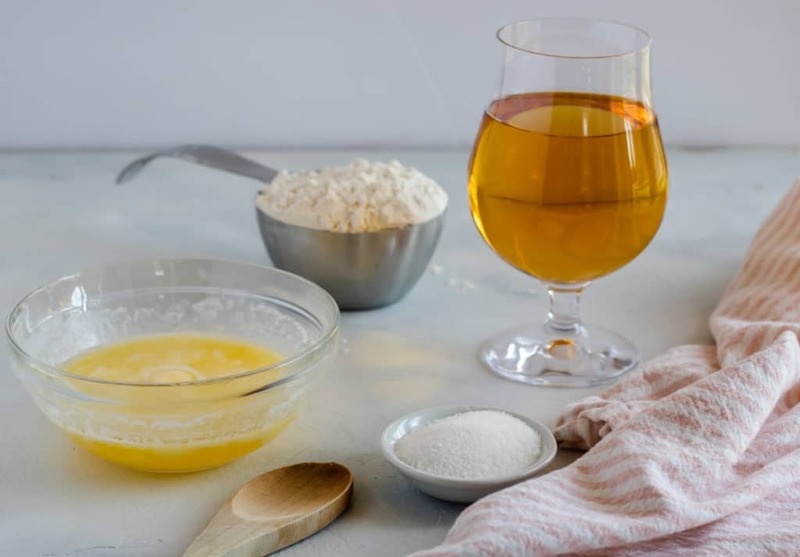 Pour the flour mixture into the beer and mix JUST UNTIL MOIST & COMBINED. Overmixing will cause your loaf to be tough. 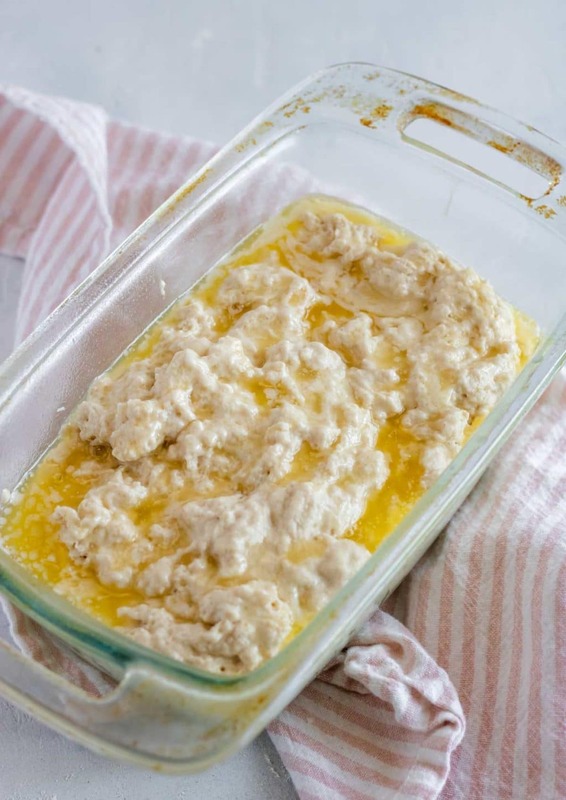 Pour dough into prepared loaf pan. Bake for 40-45 minutes, until golden and crisp on the top. this was so easy to make an my entire family LOVED it!!! thank you! !